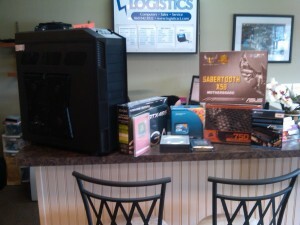 At Logistics, we specialize in building custom built desktops for gaming or everyday use. The parts we use are only high quality and they come with 3-5 year warranties (some lifetime) The benefit you have vs. pre-built from say HP or Dell, is the performance and quality. You are investing into a machine that will last for 5-10 years and will perform as fast as the day you got it. We don’t load any extra software that slows down your machine and we also provide a 1 year support warranty for free. Our machines are tuned for maximum FPS for video games, and will outperform anything you can buy at the store. We have over 15 years of experience building custom desktops for video games. Whether you play World of Warcraft, Call of Duty, or even some older games that you have lying around – our machine will play them at blazing speeds. Most custom machines take 5 days from time of purchase to be ready for pick up or delivery as we build them piece by piece. While you will spend more money on a custom desktop (our machines start around 800$), what you are getting is unmatched performance and quality for games that will play at the highest settings for years to come. So, stop by our shop and check out our custom demo – so you can see for yourself or contact us for a free quote.